Spring Session Starts Friday April 12th: 10:30am-noon! Energize, Heal, Harmonize with the Nature and the Stars! Optimize your health and wellness this Spring and get ready for summer! 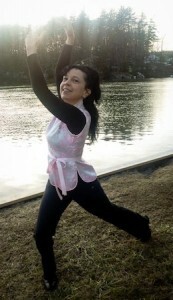 Master Qigong Instructor Robin Bonazzoli, MAc, Nationally licensed acupuncturist: 20 years of ongoing, intensive experience teaching meditation, tai chi & qigong. Robin has trained in these arts since her teens in The U.S., Japan and China, including a traditional discipleship in Japan during her 11 years there. Instructors: Robin and Leslie were amongst the first small group of foreign students (2010 and 2011) to receive formal disciple’s training in Dragons Gate Taoism in Chengdu, China under Abbess Zhang, Ming Xin (Bright Heart), 20th generation Master of Taoist Mystical Qigong at Jian Fu Palace Monastery on the holy Qing Cheng Mountain. Flow with Qi-Energy into Mind-Body-Spirit Unity! Qigong (pronounced “cheegong”) is a Chinese healing and revitalizing movement-meditation system based on the same ancient theory as acupuncture and tai chi. Join us as we flow through moving forms into breath and light to re-energize and release stress. Learn to hold simple and effective postures to build strength, to return to harmony and health of body, mind-emotions and spirit. Experience the deep stillness and the ecstatic. Qigong utilizes the gravitational force-universal life energy (“Qi”) to facilitate rejuvenation and to connect us with nature and the greater spirit. Each season (September, January, April & July) a series is offered with a specific theme.